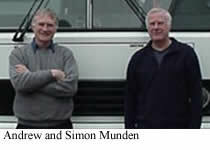 The company is owned by brothers Andrew & Simon Munden who have been involved in the bus and coach industry for over 50 years. They still run their own coach company and as such they fully understand the needs of a bus operator. This means that they are able to offer an extemely personal service with great attention to detail. "I have found them fair, honest, kind and willing to offer after sales advice." We have a reputation for modifying vehicles to your needs and can carry out almost anything you require up to and including changing buses from Right to Left hand drive and vice versa. We have exported buses world wide to such far flung places as Korea, Ghana, USA, Zimbabwe and Panama. Distance is not a problem. We are only too happy to offer parts and advice service to all our both home and abroad. We hope that you will find what you want on our web site. However, if you have any queries at all please contact us and we will try our best to help you.